Anything that gets me organized, motivated, and allows me to keep school running (nearly) on its own is a winner of an idea. Sue Patrick's workbox system sounded like a good fit for our family, except I wasn't sure how in the world I would get so many boxes in our schoolroom (plus, my frugal side didn't like shelling out so many clams to invest in them, either). 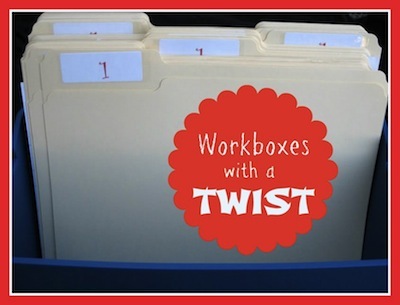 After reading through several great blogs which described how workboxes were being used in other people's homes, I landed on the idea of making work files for two of our children- the 3rd grader and the k/1st grader. While I am planted in the school room in the afternoons, available to any one who needs my help, these two girls can be working through their files systematically.